The IBM Integration User Group (UK) committee are pleased to invite you to our next gathering, which is taking place on Monday 1st April 2019 at IBM South Bank in London. The gathering will be comprised of two events, and feel free to attend both or either of them. The first event is our UK User Group Meeting, starting at 12:00 for 12:30 and ending at 17:20. 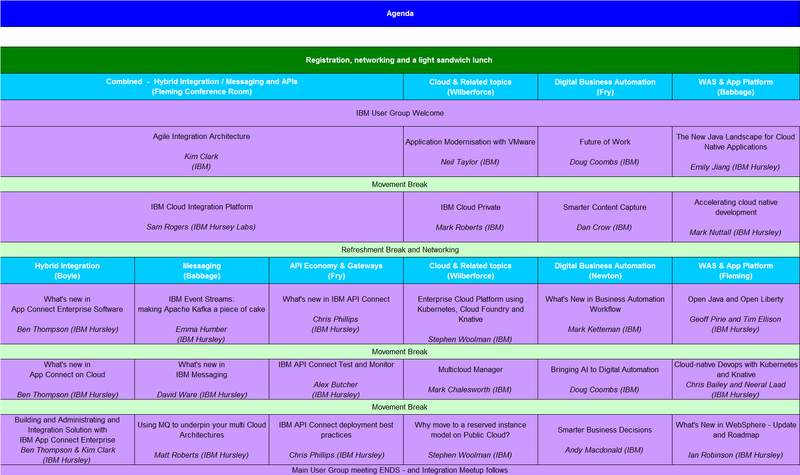 We are planning five sessions per stream, with multiple streams covering the following topics: Cloud, Integration, Messaging, APIs, WebSphere / Application Platform and Automation plus Related Topics, Technologies and Architectures. This time, our Integration User Group is joining up to present with the IBM Cloud, Digital Business Automation (DBA) and the WebSphere Application User Group so there are streams on Cloud, DBA and WAS / Application platform technologies; more detail is in the agenda. A light sandwich lunch will be provided during registration. To book a place, please click 'RSVP' on the right. You can attend either or both of the events, and as such each registration is dealt with separately. Please join our ‘IBM Integration UK User Group’ local group on the IBM Community site, as this is our main communications route.